With its tenth anniversary approaching, the 2008 global financial crisis has had significant ramifications in the UK that are still being felt today. One of the groups that has been most affected are young people, in part because they will live with the aftermath of the crisis for longest, and in part because of the crisis’ specific impact on their socio-economic circumstances. Young people also appear to be on the front line of structural change within the economy, evidenced by a stratification within the labour market between secure, high-skilled employment (in industries such as finance, business services and advanced manufacturing) and precarious, low-skilled employment (in industries such as retail and care). With growing flexibilization, the ‘gig economy’ and rapidly advancing automation, the world of work is changing, and as such a new generation of young workers will be subject to labour market conditions unlike those that past generations have experienced. A new SPERI report by Craig Berry and Sean McDaniel presents new research on the perspectives of young people themselves on this transformation. 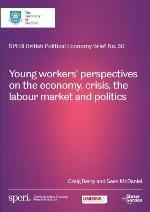 Utilising focus group research, this new SPERI British Political Economy Brief considers whether young people are content to work within ‘the new normal’, and whether they are willing to challenge prevailing economic circumstances in order to refashion the labour market. The research presented here is part of a larger study funded by Unions21 in conjunction with Slater and Gordon. The focus here is on attitudes to the economy, work and politics, but the larger project focuses also on attitudes to trade unionism and industrial relations. A final report for the project will be published in early 2018.